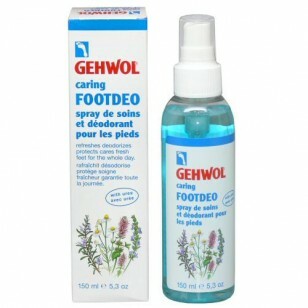 The FootDeo spray with natural caring substances refreshes while eliminating foot odour and soothing dry skin. Urea and Allantoin provide moisture and prevent calluses promoting smooth and healthy feet. The valve provides easy, economical application and can be used upside down for quick and convenient foot care. Directions: For daily hygiene, spray onto the feet, paying particular attention to areas between the toes.